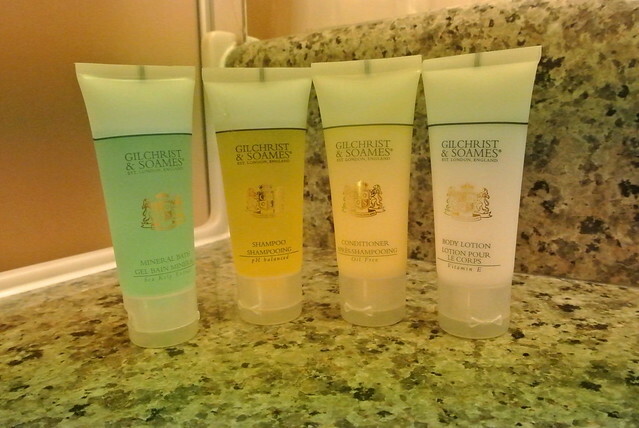 On our recent cruise on Royal Caribbean's Monarch of the Seas, we were lucky enough to get a taste of the "suite life" in a Grand Suite. The Monarch is one of the cruise line's older ships and is in the smallest class. In fact, Royal Caribbean has sold the Monarch to their Italian line, Pullmantur, and she will be removed from the fleet in April. 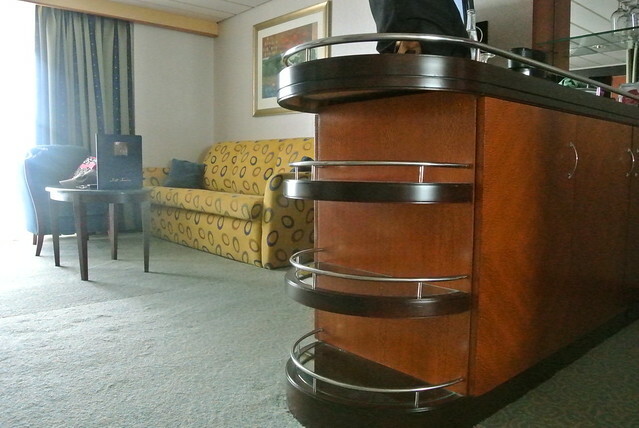 However, while the staterooms are much smaller than what is typically found on newer Royal Caribbean ships, the suites are still spacious and comfortable, though dated in decor. 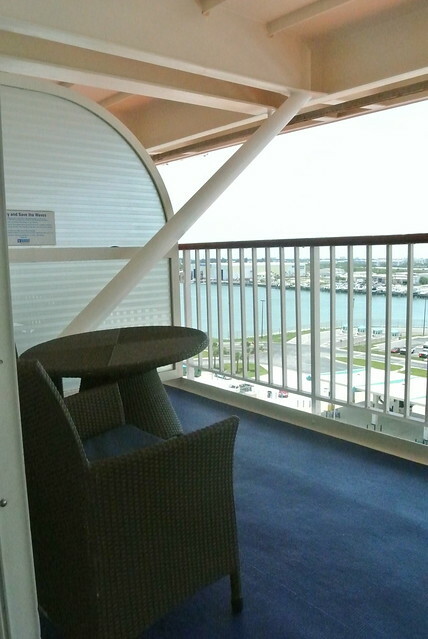 The Monarch doesn't have any balcony staterooms besides suites. 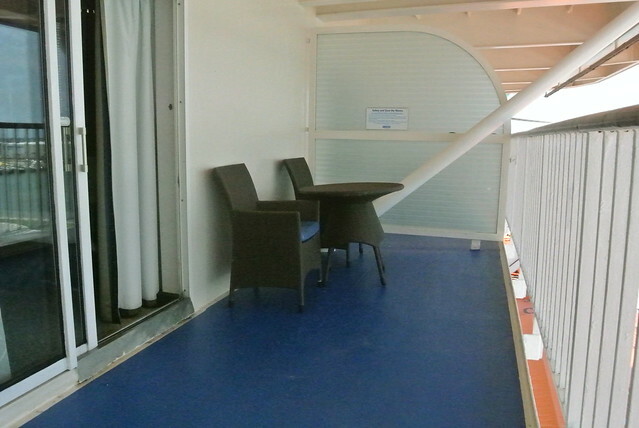 All of the suites are located on deck 10. 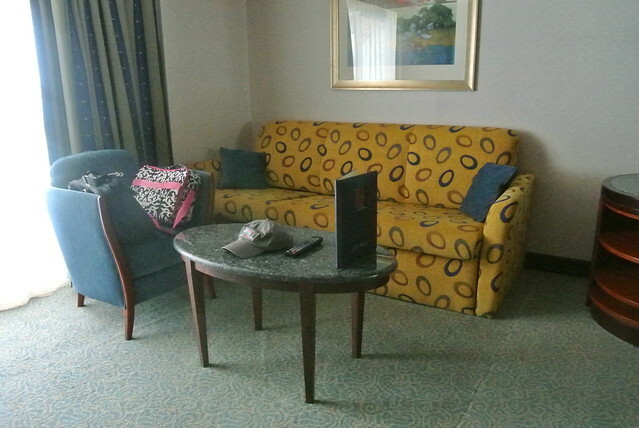 We were in room 1038, which was the Grand Suite closest to the elevator on the starboard side. 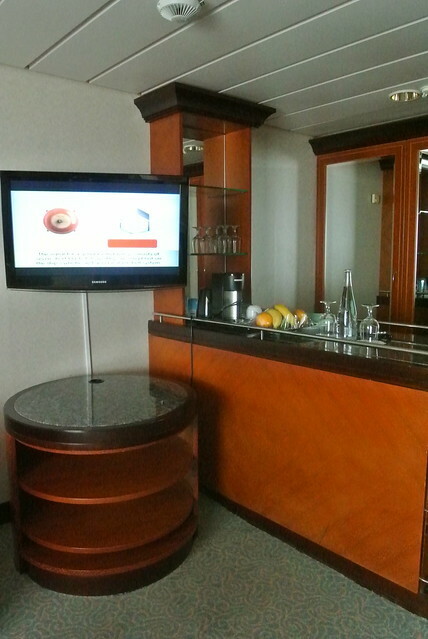 The suite had a dry bar equipped with glassware and a coffee maker, as well as a flat-screen television (regular staterooms had tiny old-school box TVs). 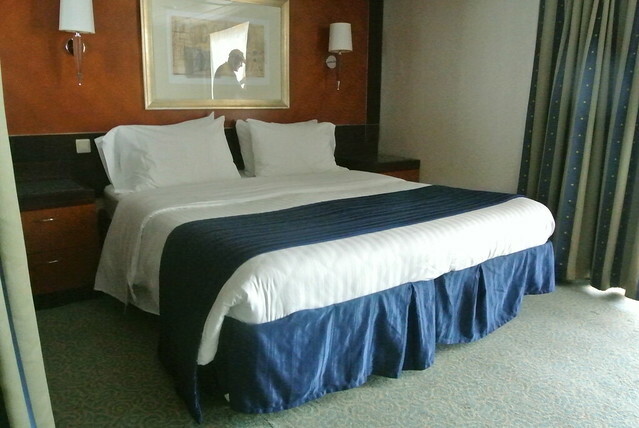 The room had a king bed with plenty of floor space on all three sides. 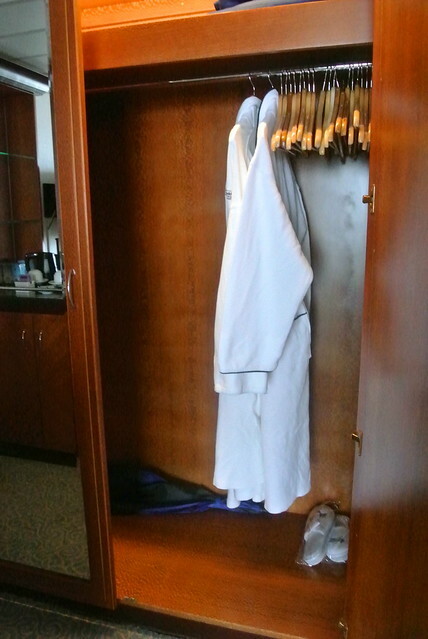 Three large closets with robes and slippers. 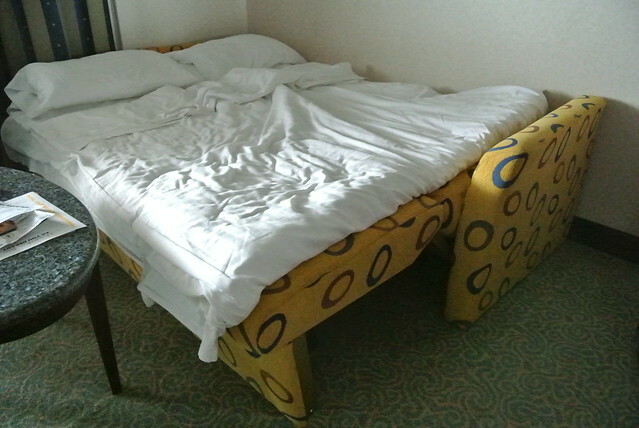 The sofa bed folded out into a queen size bed. The balcony was very large. We were welcomed with bottled water and a fruit basket. 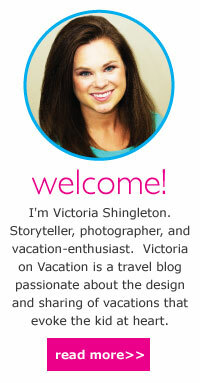 As well as several invitations to events throughout the cruise. The bathroom had a full-size bathtub. 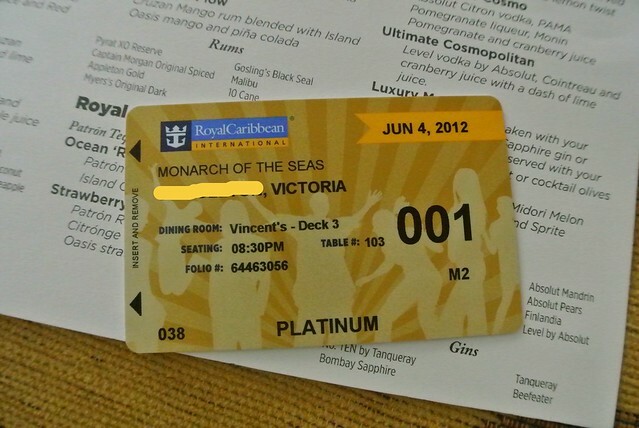 Suite guests receive gold SeaPass cards so that they can easily be identified by crew members. 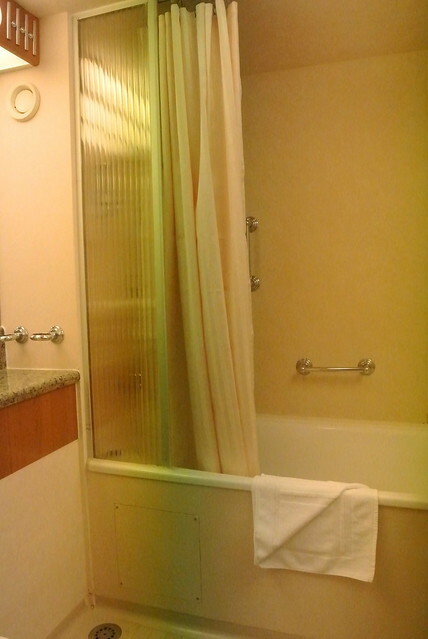 On larger cruise ships, gold SeaPasses give people access to the Concierge Lounge and reserved seating on the pool deck, but the Monarch of the Seas didn't have the amenities (alternative to Concierge Lounge was an invitation to the nightly Diamond Plus event in the Viking Crown Lounge). 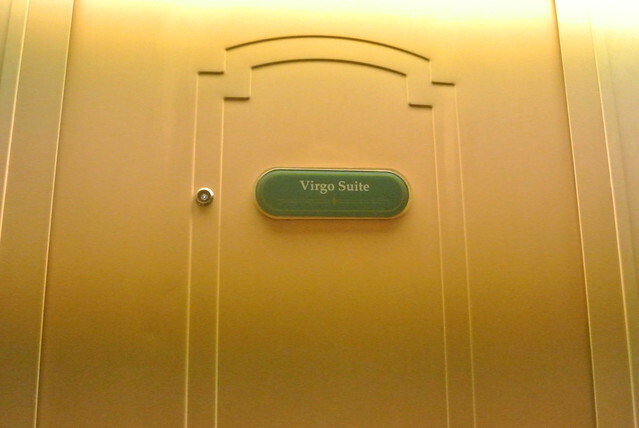 There was, however, a reserved area in the Sound of Music theater for suite guests. One of our favorite suite perks was the ability to order room service from the dining room menu. 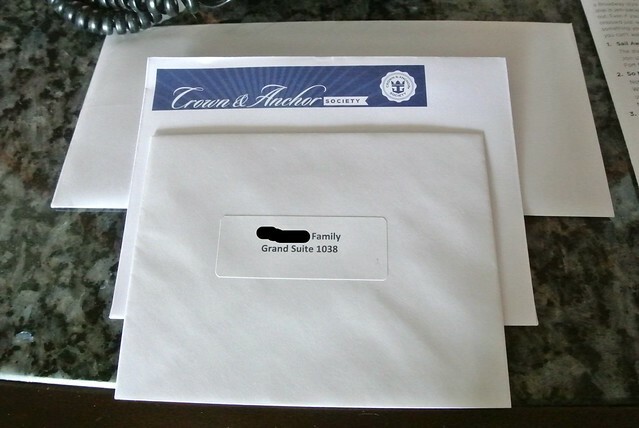 Instead of having to fill out the breakfast room service card the night before, we could call that morning and have breakfast delivered to the room. 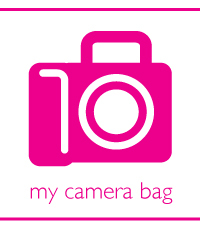 It was a great convenience and sure beat battling the crowds at the Windjammer. We were really glad that we chose to stay in a suite. It was a good experience and did spoil us a little. 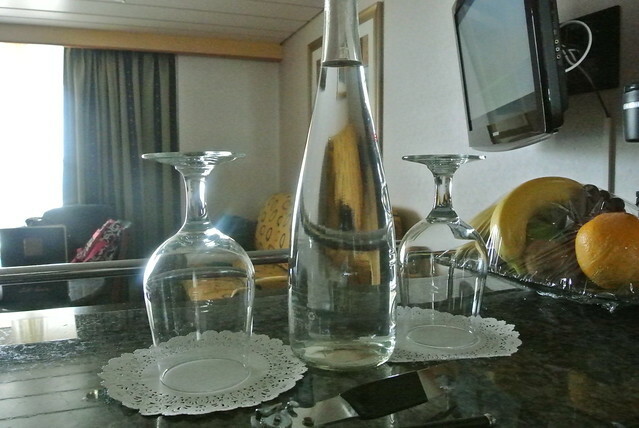 The 4-night cruise was an affordable way to see if the suite benefits were worth the upgrade (and on a larger ship, there would be even more benefits). 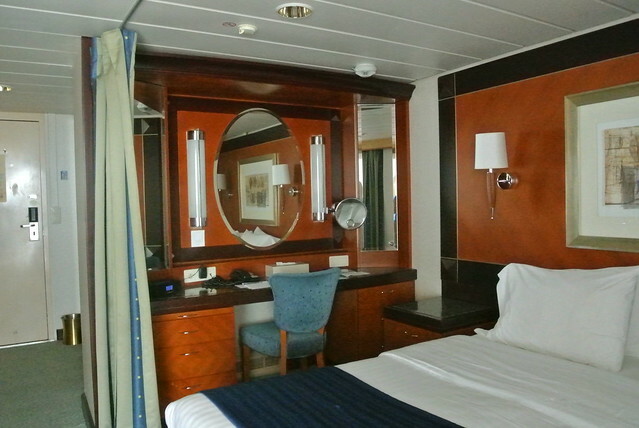 Check out more staterooms - visit the Stateroom Gallery!